Crane wheels are frequently operated in a heavy industrial environment, in which wear is caused by adverse temperatures, loading or misalignment. In response to the urgent requests of many of our clients, we have developed an effective solution to this problem. 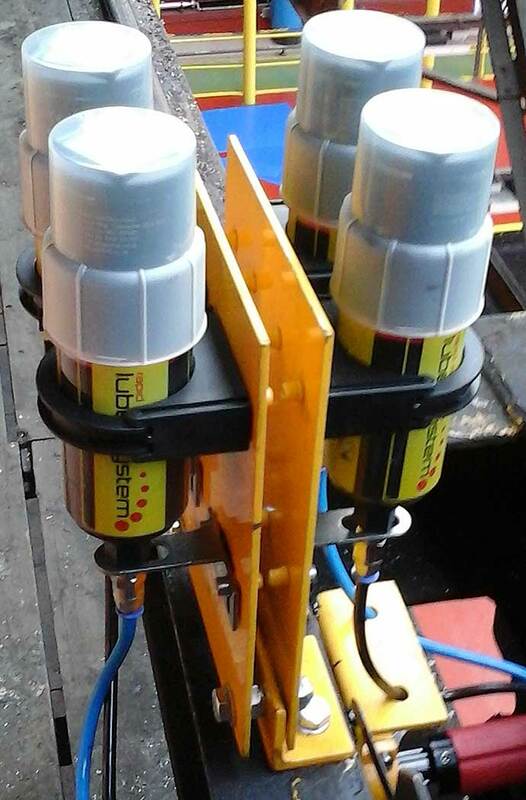 Rapid Rail Crane Wheel Lubrication System extends crane rail life, reduces crane wheel wear and subsequent heavy repair bills removes maintenance costs and improves operational efficiency. 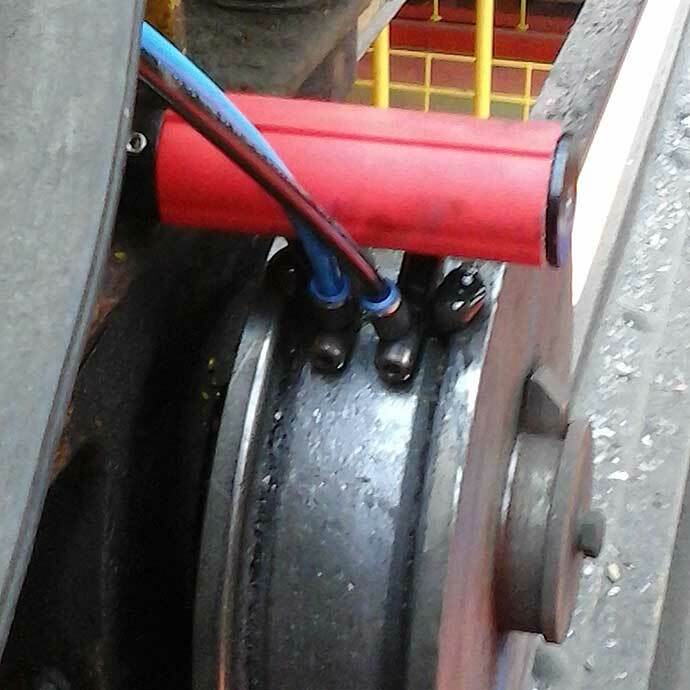 Rapid Rail Crane Wheel Lubrication System automatically discharges a specifically formulated lubricant into the inner surface of the wheel flange. This is then transferred to the point of contact on the rail head, reducing the friction which causes wear. The goal is to reduce the coefficient of friction and therefore prolong the life of the Crane Rail and Wheels. The frequency and volume of the lubricant is pre-set which avoids excessive grease build up and minimises cleaning. The setting can be adjusted during each life cycle, to accommodate changing circumstances. The rail and clips can be examined fully during routine maintenance checks, which are free until the cartridge requires replacing. This is always changed as a complete unit with the batteries when rate of production requires it. The unit is mounted on the crane by a simple bracket and protected from weather with a plastic cap. The attached probe has an additive, Molybdenum Disulphide – which is ideal for preventing wear against metal, by filling the microscopic pores to create smoother surfaces. Widely used in Europe, UK and USA. 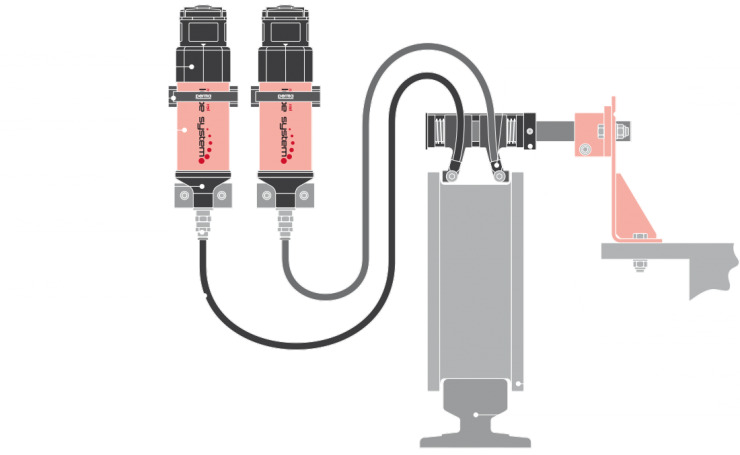 A similar lubrication system can be offered for any engineering application where lubrication is necessary to provide a smooth maintenance free operation.